Swimmer's ear is an inflammation, irritation or infection of the outer ear and ear canal. The medical term for the condition is otitis externa. Any activity that exposes the external ear to water can lead to swimmer's ear. Ear wax build-up that traps water behind the obstruction. Abnormal bone growth, also known as surfer's ear, can trap debris and water and lead to an infection. If you swim frequently, swimmer's ear may easily recur so prevention is very important. Overzealous cleaning of the ear can tear the delicate tissues of the ear canal making the ear susceptible to infection. Any irritation to the delicate ear canal tissues. 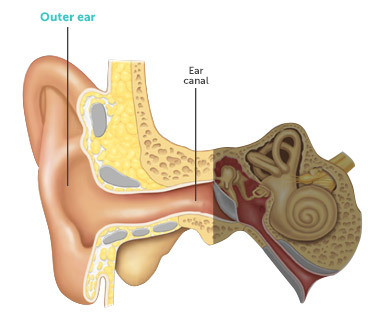 Find out what the symptoms are for ear wax build-up and ear ache. 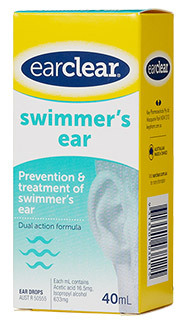 earclear swimmer's ear can be used every time the ear comes in contact with water to dry up the excess water and prevent the condition from occurring. Do not use if the ear drum is perforated or if discharge is present. Consult your doctor if these conditions are present. Avoid contact with eyes or broken skin. Keep away from open flames. If irritation occurs or sensitivity develops discontinue use. For external use only. Contains Hydroxybenzoates as preservative.